Great Britain's men have qualified for the Rio Olympic Games after confirming their place in the World Gymnastics Championships team final. 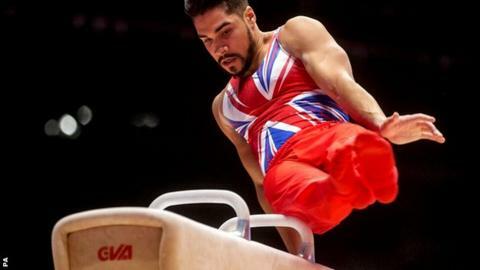 The top eight nations in Glasgow guarantee places in Rio, and Great Britain's score of 354.417 on Sunday proved enough. Great Britain finished qualifying in third place behind Japan and China. The team consists of Max Whitlock, Dan Purvis, Louis Smith, Nile Wilson, Kristian Thomas and Brinn Bevan. "Getting the team to Rio was the number one priority coming here and we're all delighted to have got the job done," said Thomas. "Every member of the team contributed and we go into the team final knowing we have even more to offer to push for a medal." Smith posted a commanding 15.533 on the pommel horse in his first World Championships appearance since 2011 on Sunday. Purvis and Whitlock are expected to qualify for the individual all-around final, although Whitlock and Bevan, competing in his first Worlds, were early fallers on the high bar. Japan outscored the current Olympic and world champions China with 358.884, despite an uncharacteristic fall by their star Kohei Uchimura during his floor exercise. "It looks like we can at least get to the team final and that is really great, but it's important not to drop points," Uchimura told BBC Sport. Uchimura is also going for a sixth successive individual all-around world title, but said: "Firstly I have to only think of that once the team final is over. "Honestly, the only thing that was good about my own performance out there was my determination. But I hope to bounce back in the team final."